The burnt residue on the case mouth is from an inadequate seal which allows pressure to leak past the case mouth back toward the case head. Annealing might make it go away. Sometimes it just seems to be due to a powder with a lower burn rate. i think the chamber also matters, as those with a throat or freebore for lubed groove sized bullets allow added room when using bore size paper patch slicks that's harder to seal off the gases. You might size a few 45-70 cases of differing manufacturers and see what the case thickness at the mouth is. The thicker the case wall ,to a degree, could take up the excess space in the standard chamber giving a quicker seal. Be sure to trim to fit the chamber length and anneal the cases. Little more compression will change that. Excessive fouling such as your getting is usually a sign that the powder needs more compression. i had a roller and its grease groove chamber had a goodly throat/freebore. it was not meant for bore rider PPBs, but i entered into patching with that gun and would get blow back around the case because the bullets were .4495" in diameter and not .459". the gun and cartridge was very accurate, and i only load with real black powder. but if there's room at the case mouth in the chamber, and the cartridge is a smaller diameter, it won't seal well ... but it might be be better if the brass is annealed. in the long run, that gun now sports a true PPB chamber and there are no blow back issues, and brass does not require annealing. but it can never again shoot greasers. in your 16 twist 40-65. Before I switched over to just shooting muzzle loaders, my mentor, who had won many matches and makes a pretty bullet lube told me what to do. First you have to waste some lead (not perfect bullets) and powder and fire form the cases. Next clean them in Dawn and water, then use a ceramic tumbler to get them sparkling. Next square the edge of the case mouth and match all case lengths exactly. Next just before loading use an expander and bell the case mouth very slightly and try them to see what the seal will be like. He used a seater tool which I made a copy of (and are for sale on the ASSRA website) to push them the final 1/16 inch or so. Set the expander die so all will be the same amount of bell. Finally do the loading, powder compression, ETC, ETC. I know this is what you already do anyways but I wanted to show where belling the case mouth fits in. I never annealed any cases and my mentor never did either. Nice shooting! Are you wet or dry patching those two diameter pills.
. So here are 2 cases. One was sized at the moth and the other was not. This darkening isn’t apparent until sometime after the case has been fired. yup, that's what happens with a PPB bore rider in GG chamber, no sealing. yers looks lots worse than mine was. are you annealing the brass? if you really only wanna load and shoot PPB's, yer chamber can be drilled, sleeved, and properly recut with a rented PPB reamer. i had that done to a pair of rifles and the result were just excellent in every way. however, those guns can't ever load GG cartridges, which is just fine by me. ymmv. I do Anneal after each firing. Those were very early in my paper patch trials and for whatever reason they arnt as bad now but they still do it. It’s not real apparent when they are first fired but the next day is usually when they are black like that. To be honest with you I have been more than happy with the performance of my standard chamber and my bore diameter bullets. When I call up c sharps and get another rifle I will want the same chamber design which is just a standard Sami spec chamber. 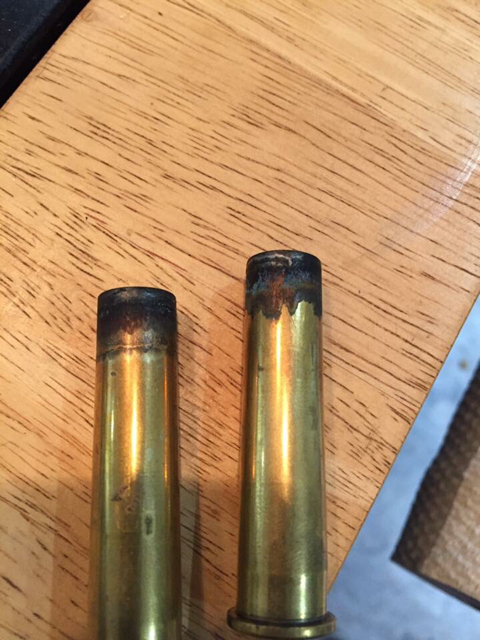 if a day later yer cases look like those images you posted, so yer not cleaning the brass ASAP? Nah. Sometimes I don’t drop them into a bucket of water until the next day. When I’m at a match I just don’t feel like de priming then and doing all that while I am trying to stay focused for the shoot.